Our rooms are equipped with basic and functional furnishings. We offer twelve different room categories, from single rooms / double bedrooms / multiple bedrooms to a loft, and apartment (with or without kitchen). 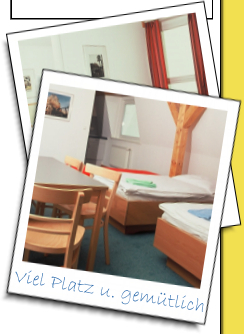 Every Berlin visitor should be able to find an offer suitable for their needs here in our hotel. We are here for you all around the clock, at our reception and the bar. Late arrivals are no problem for us. We offer a wholesome breakfast buffet from 7:00 am to 10:00 am and on the weekends until 11:00 am! Here you can get ready for your day in Berlin.